Brunch is easily my favorite meal, Chef’s and restauranteurs come up with creative menu options to satisfy your breakfast and lunch cravings. 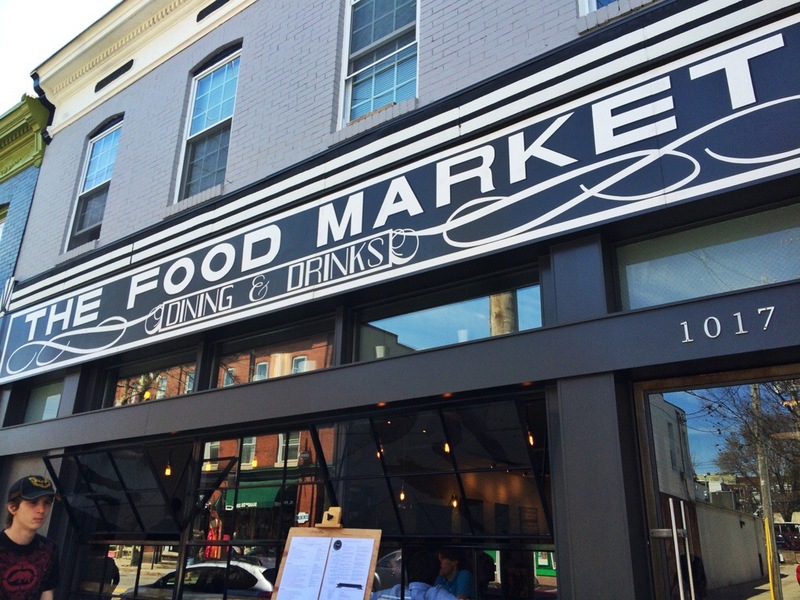 In Hampden, one of my favorite restaurants for an upscale meal is The Food Market, I’ve been there numerous times for dinner but never for brunch. That all changed last week when me and a few friends headed over to Hampden to check out what amazing brunch specialties Chef Chad Gauss has been cooking up. The meal started with some complimentary bread, normally I don’t ever think to include or photograph this for my reviews, but this load was so light and fluffy with swirls of chocolate mixed in which really got my friends excited for the meal. The menu was split up into ‘funchies’ ‘brunchies’ and ‘lunchies’ and we decided to order a few things and share with the whole table because everything looked amazing. We started off with the Amish Soft Pretzels that came with beer cheese fondue for dipping. The pretzels were soft and fluffy like pretzels should be. But the beer cheese fondue really stole the show. The fondue was made with pepper jack cheese and had a wonderful spiciness to it. 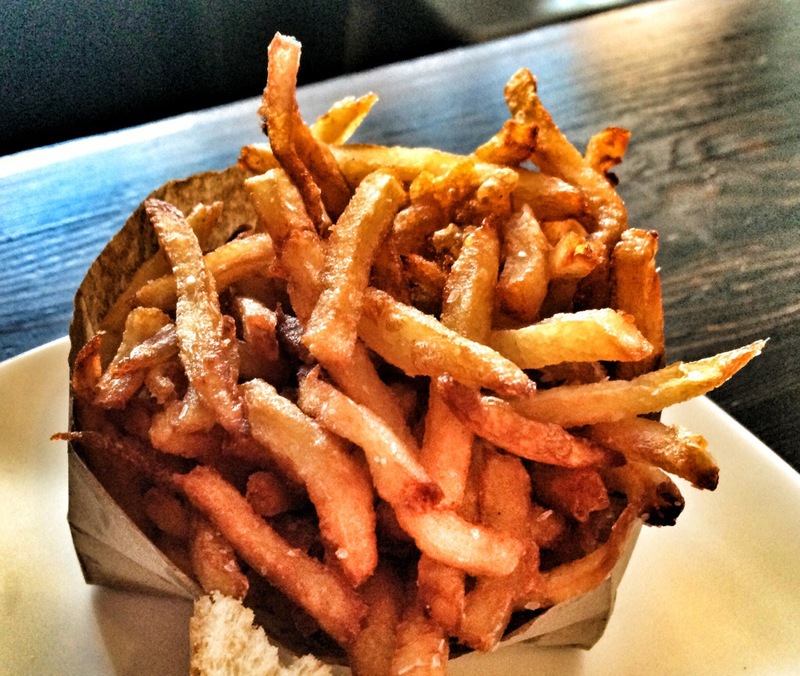 When the pretzels were finished, we saved the extra sauce to dip our fries into. It was that good! We also decided to share the House Made Pop Tart. 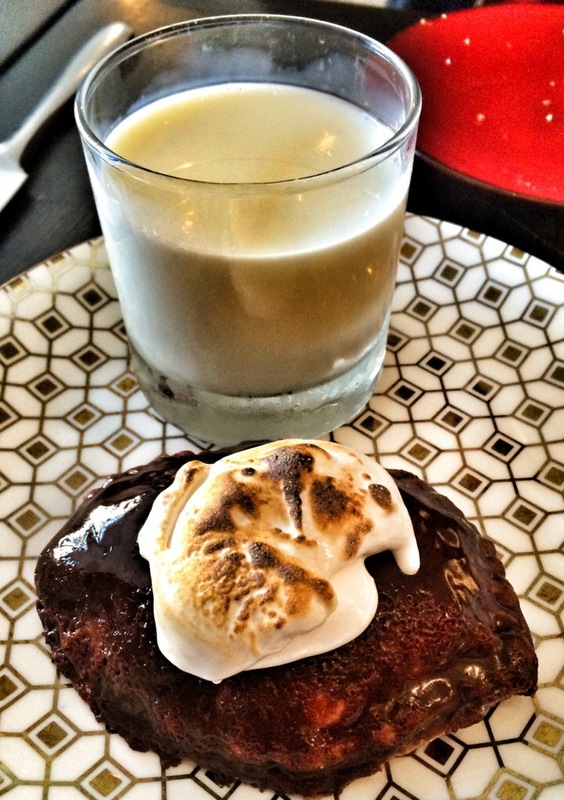 The flavor of the day was S’mores and it came with a nice glass of milk. The pop tart was a little too sweet for me but my friends loved it. It reminded us of our childhood and it was so fun to eat a pop tart that didn’t come out of a box. The French Toast Dippers also caught our eyes. 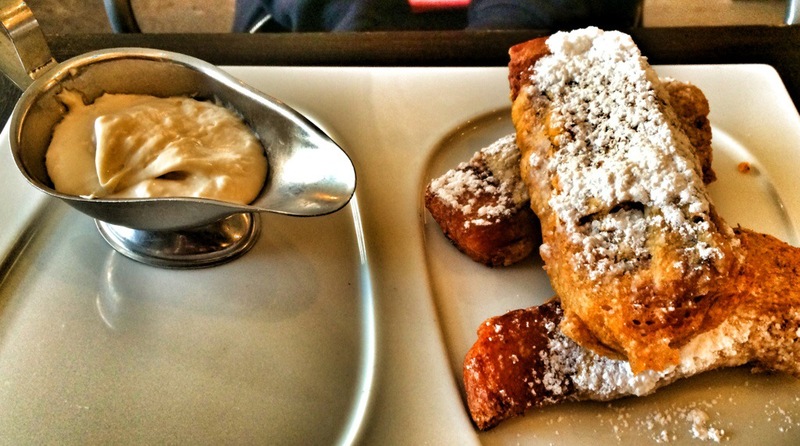 The french toast sticks were tempura fried and served with a maple cream cheese fondue. Personally I don’t like cream cheese icing so I stayed away from that, but my friends loved it and the french toast sticks were awesome. I’ve never had tempura fried french toast before and I don’t know if french toast will ever be the same for me. Under the ‘brunchies’ section of the menu, we decided to opt for something a little bit lighter, the Huevos Quesadilla. This was good, but the least exciting part of the meal. 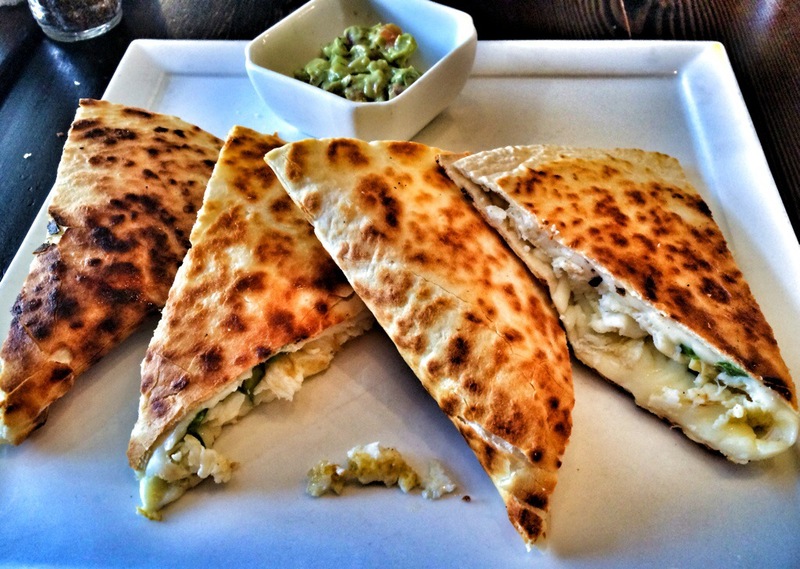 The quesadilla was stuffed with egg whites, mozzarella, jalapeño and guacamole. Unless you added the guacamole, the dish was a little bland. It could have used a little bit of salsa or veggies for added flavor. Lastly, we decided to try the ‘Pastramied’ Beet Rachel from the ‘lunchies’ menu. 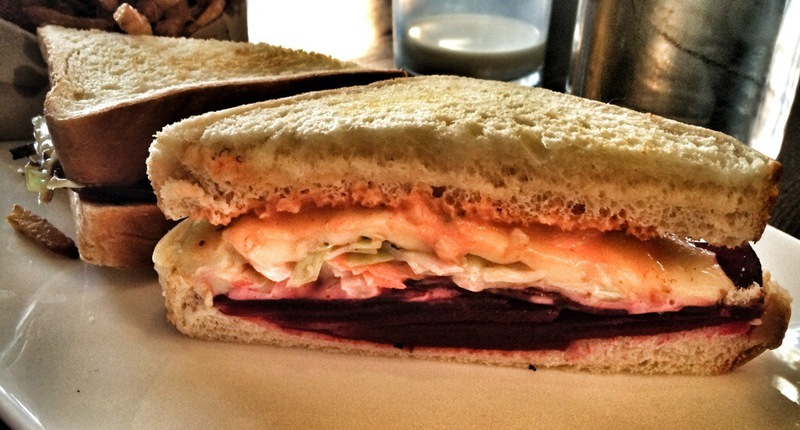 This was a vegetarian sandwich with thinly sliced beets, cheese, cole slaw and Russian dressing. While I probably would have preferred this with roast beef instead of beets, it was still very good and a clever way to turn a traditional sandwich into something vegetarian friendly without losing too much. The Food Market is located at 1017 W 36th St. in Hampden. 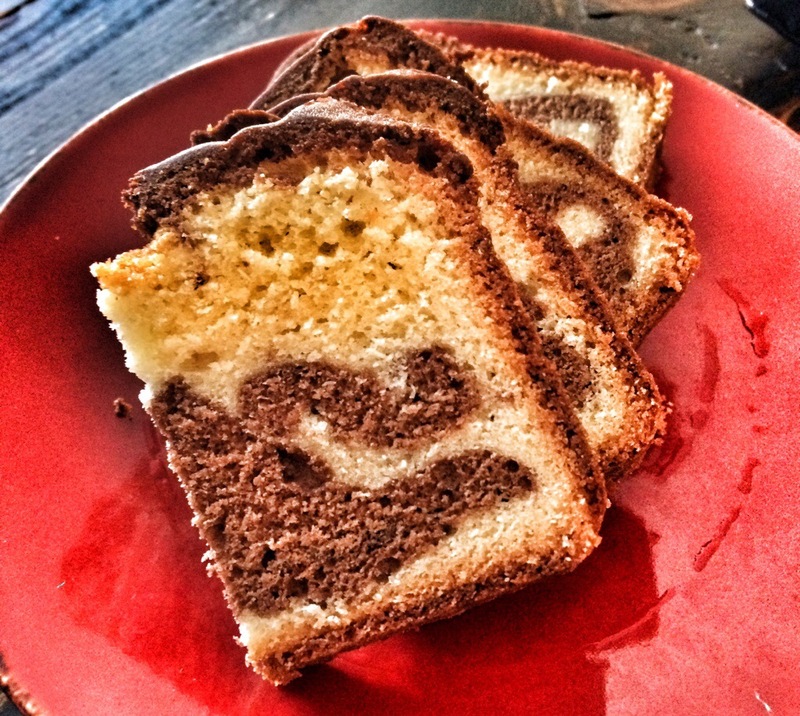 Pingback: My Take on Baltimore Mags’ 2014 Best Restaurants | eating my way through Charm City! Thanks for the link! I just went there this past weekend and had the smokey bowl. Outrageous! Huge! Savory! Everything you want for brunch.